I know, back to school! It’s not even the end of July, but I’ve already started buying school supplies so that the financial hardship that it brings isn’t so “all at once”. I’m not really ready to start making back to school crafts, but I thought I would share this fun sign I made a few years ago. The idea is to hang this on the front door. When the sign says “doing homework” friends will know to come back later. You see I actually had a deep need for this sign a while back. My kids’ friends would come and knock on the door looking for my boys. The most common answers I gave were “they are doing homework” or “they are outside playing”. This sign was a big help in answering that question for me! * I purchased my shirt sign at Michael’s Craft Store. Paint the entire sign with one coat of Gesso. If you don't have Gesso, you can find it in the art department of any craft supply or hobby store. Alternatively, you can use a coat of white acrylic paint. Allow to dry completely. Paint entire sign with yellow acrylic paint. Let dry and repeat with a second coat. The stripes do not require a pattern, uneven lines add to the character of this project. 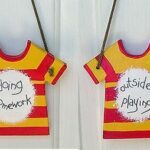 After yellow paint has dried, use a medium flat brush to paint on wide red stripes, starting at the bottom of the shirt and working your way upward. Paint a red collar band and sleeve bands on as well. Repeat on the other side. Let dry completely. Before this step, be certain that the red paint is completely dry or the white will turn pink. Use a large scruffy brush to dab on a white oval in the center of the shirt. Let dry and repeat. Let second coat dry completely. 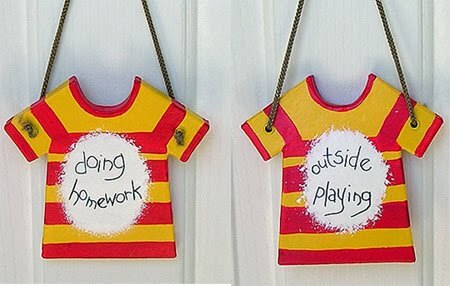 Use a black craft pen to write "outside playing" on one side and "doing homework" on the other side. Spray both side with acrylic sealer spray and let dry overnight. Hang! To use: Simply hang on your child's door, or on your front door. Have your child flip the sign to the appropriate side when needed. Great Idea!!! found you over at CSI. That's a great idea! I'm always doing the same thing. Maybe I need to make a sign too. This is adorable. I think I need one for me! That is such a cute idea. I love this. I will be attempting to make this for my little girl, but use a dress instead of a shirt. I think this is a good idea. When my children were much younger, I had a new baby and all the children napped at the same time, so I did too, every day without fail the neighbor children would bang on the door, they didn't just wait a minute in between knocks either, it would wake everyone up and make a mad mom of me. One day I made a door hanger with a photo of my newborn sleeping but no words. I hung it on the door and they never knocked if it was hanging up, they'd just wait until they saw us outside then come on ever. Even if they hadn't been taught to ask their mother first they good and well knew better than to wake a sleeping new baby! Thanks so much for all of your kind comments everyone! Thank you. I actually need this. We homeschool, and we started school last week, but the neighbors haven't started public school yet. Something like this will save a lot of headache.